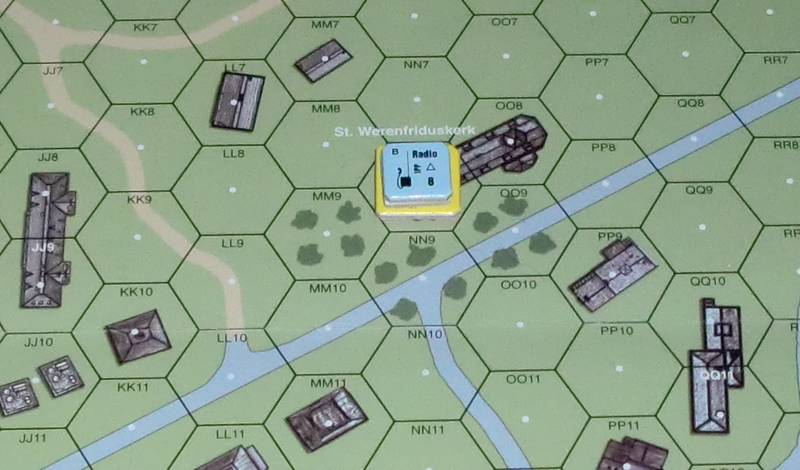 The victory conditions state that the British must control the St. Werenfriduskerk (Grote Kerk) in ELST and also exit ≤ 20 VP worth of infantry elements off the map towards the Nijmegen to Arnhem overland road (FF28 to TT7) and the railroad which is situated to the east of Elst. The Germans need to prevent this to win. There are 6 campaign game scenarios in total, each lasting up to 8 turns. An unimpeded MMC could traverse this distance along the paved road through Elst within a single scenario. The British will attack with superior numbers and they can choose the exact sector for their main effort. They will probably advance astride the main road towards Elst. Their aim will be to decimate the defenders and to control as many buildings as possible as to open the road to their advance. One can easily deduce that the Germans need to prevent an early breakthrough. Keeping the area control rules in mind one sees the need to fight for every building on the map especially along the main road. They also must keep their flanks protected or will suffer from failure to rout. In relation to the area to defend the 13 MMC are only barely able to form a single tripwire line of defence. With their mobility as well as superior armour and armament the 2 Panther G tanks will act as a mobile reserve. 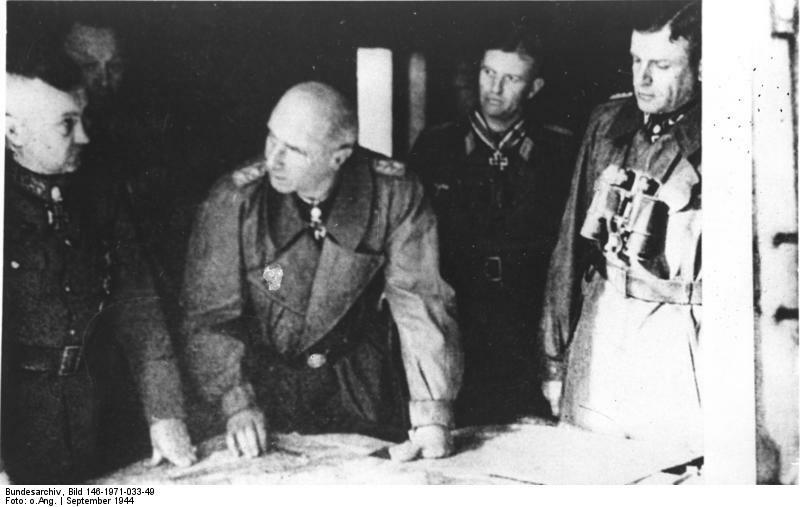 The German commander will have to scrape an infantry reserve from unengaged front line units, as soon as the main British axis of attack has materialised. The main use for the OBA is to deny British units areas that could be used for a fast breakthrough. Looking at the map the northern sector consists of mainly grain and polder. This terrain will slow down infantry and also prevents a fast break through by tanks. The only reasonable objectives here are the buildings in A4 and C1 and the row of houses in L6 to R3. Only east of the first line of polder the LOS from the church tower is impeded by orchards (hex row I/J). Assuming that we will use the church tower as observation post the forward observer can intervene by directing the OBA to this area. The main task of the Germans defending here will be to hinder any fast advance of infantry and armoured units towards the L6 to R3 buildings and subsequently to prevent a threatening of the right flank of the elements defending the main road. 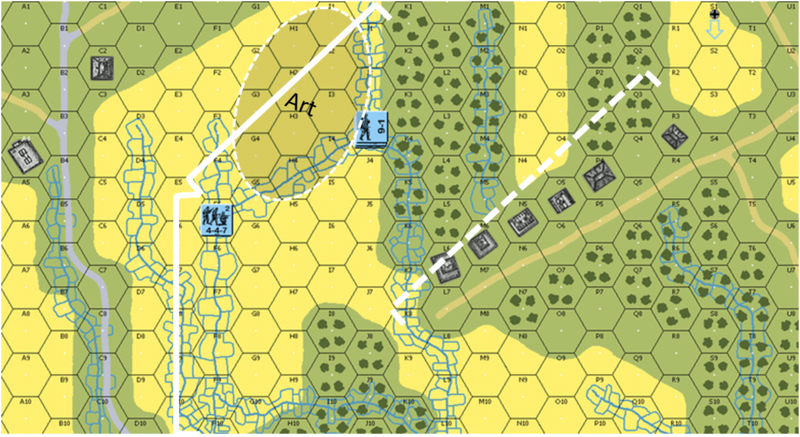 The paved road traverses the central sector in its full length with the entrance hexes A12 and A19 in the west and the VP exit hexes TT6, TT7 and TT20 in the east. The sector is characterised by a mixture of open ground, grain, polder, orchards, and some 50+ buildings. Latter constitute the most attractive objectives for the attacker. 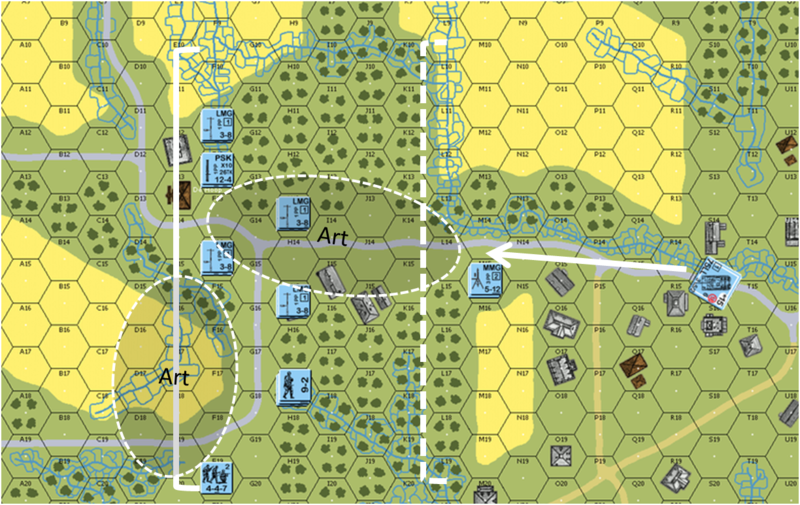 The buildings near the G14 junction of the main road at De Hoop will probably be the main British sub-ordinate objective in the first scenario. Orchards and building impede artillery spotting in most places at least up to row U north of the road and line DD south. This will render the effective use of OBA difficult. German defence here needs to absorb the assumed British main effort in a delaying action. They are to contain the enemy west of row L. Accordingly this sector will constitute the main German defensive forces. This sector is characterised by a large orchard in the west followed by areas of grain and open ground, all intersected by polder. Between hex rows K and R we find a sprinkling of some 12 buildings and an unpaved road that leads to the main road. The large patch of orchards in row A to F offers the British a covered approach free of polder (hex lines 27 to 29). Here enemy tanks could break into the left flank of the Germans defending the main road. Thus this area is to be protected by forces able to neutralise enemy armour. 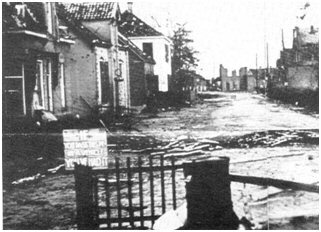 The Germans are to fall back slowly and inflict enough friction to the attackers as to deny them the exit off the eastern part of the town until at least the evening of the 25 September. This is my proposal for an initial plan of defence for Elst. In ASLSK there are no environmental conditions, concealment or snipers. All this would add realism to this most interesting field of battle. On the evening of the 22 September it was raining heavily during the first British attack. Feedback and alternative ideas are highly welcome. So feel free to comment on your view toward a dynamic defence of Elst.